Note: Due to the political conflict in the Democratic Republic of Congo, we are not currently offering this tour package. We advise prospective clients to book any of the following alternative tours. Day 2: Gorilla trekking in Virunga national park. Kisoro Traveller’s Rest Hotel is in the outskirts of Kisoro in a very interesting but unique environment. 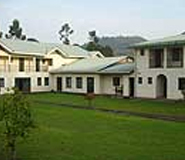 Kisoro Traveller’s Rest Hotel was built in a colonial style with a relaxing atmosphere. The hotel is easily accessible too and was frequently used by the famous Mountain gorilla researcher Dianne Fossey during her studies. 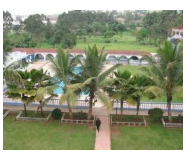 Kisoro Tourist Hotel in Kisoro is an ideal solution for those visiting the South West of Uganda, and those on their way to Rwanda, the DR. Congo and Nkuringo sector of Bwindi Impenetrable Forest National Park for gorilla tracking activities. The hotel enjoys a wonderful location in the shadow of the Virunga volcanoes enjoying an incredible panoramic views of these mountains which border Rwanda, Uganda and DR Congo.